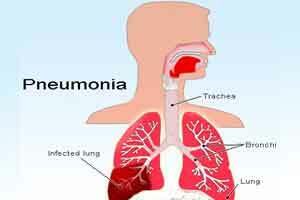 Pneumonia is an infection of the lung tissue. When a person has pneumonia the air sacs in their lungs become filled with microorganisms, fluid and inflammatory cells and their lungs are not able to work properly. Diagnosis of pneumonia is based on symptoms and signs of an acute lower respiratory tract infection, and can be confirmed by a chest X‑ray showing new shadowing that is not due to any other cause (such as pulmonary oedema or infarction). In the year 2014, National Clinical Guideline Centre came out with the guidelines on Pneumonia in adults: diagnosis and management. Do not routinely offer antibiotic therapy if the C-reactive protein concentration is less than 20 mg/litre. Consider a delayed antibiotic prescription (a prescription for use at a later date if symptoms worsen) if the C-reactive protein concentration is between 20 mg/litre and 100 mg/litre. Offer antibiotic therapy if the C-reactive protein concentration is greater than 100 mg/litre. Consider home-based care for patients with a CRB65 score of 0. Consider hospital assessment for all other patients, particularly those with a CRB65 score of 2 or more. Consider home-based care for patients with a CURB65 score of 0 or 1. Consider hospital-based care for patients with a CURB65 score of 2 or more. Consider intensive care assessment for patients with a CURB65 score of 3 or more. Stratify patients presenting with community-acquired pneumonia into those with low-, moderate- or high-severity disease. The grade of severity will usually correspond to the risk of death. Do not routinely offer microbiological tests to patients with low-severity community-acquired pneumonia. Put in place processes to allow diagnosis (including X-rays) and treatment of community-acquired pneumonia within 4 hours of presentation to hospital. Offer antibiotic therapy as soon as possible after diagnosis, and certainly within 4 hours to all patients with community-acquired pneumonia who are admitted to hospital. Offer a 5-day course of a single antibiotic to patients with low-severity community-acquired pneumonia. Consider amoxicillin in preference to a macrolide or a tetracycline for patients with low-severity community-acquired pneumonia. Consider a macrolide or a tetracycline for patients who are allergic to penicillin. Consider extending the course of the antibiotic for longer than 5 days as a possible management strategy for patients with low-severity community-acquired pneumonia whose symptoms do not improve as expected after 3 days. Explain to patients with low-severity community-acquired pneumonia treated in the community, and when appropriate their families or carers, that they should seek further medical advice if their symptoms do not begin to improve within 3 days of starting the antibiotic, or earlier if their symptoms are worsening. Consider a 7- to 10-day course of antibiotic therapy for patients with moderate- or high-severity community-acquired pneumonia. Consider dual antibiotic therapy with amoxicillin and a macrolide for patients with moderate-severity community-acquired pneumonia. Consider dual antibiotic therapy with a beta-lactamase stable beta-lactam and a macrolide for patients with high-severity community-acquired pneumonia. Available beta-lactamase stable beta-lactams include co-amoxiclav, cefotaxime, ceftaroline fosamil, ceftriaxone, cefuroxime and piperacillin with tazobactam. Do not routinely offer a glucocorticosteroid to patients with community-acquired pneumonia unless they have other conditions for which glucocorticosteroid treatment is indicated. Consider measuring a baseline C-reactive protein concentration in patients with community-acquired pneumonia on admission to hospital, and repeat the test if clinical progress is uncertain after 48 to 72 hours. Consider delaying discharge for patients with community-acquired pneumonia if their temperature is higher than 37.5°C. Advise patients with community-acquired pneumonia to consult their healthcare professional if they feel that their condition is deteriorating or not improving as expected. Offer antibiotic therapy as soon as possible after diagnosis, and certainly within 4 hours, to patients with hospital-acquired pneumonia. Choose antibiotic therapy in accordance with local hospital policy (which should take into account knowledge of local microbial pathogens) and clinical circumstances for patients with hospital-acquired pneumonia. Consider a 5- to 10-day course of antibiotic therapy for patients with hospital-acquired pneumonia.